Now this is fun. Learn how to make a Pop Up Card and a Punch Art-Frog. Today's Video Tutorial will walk you through the steps of making a Pop Up Card and show how to construct a Punch Art Frog. Pop Up Card with Punch Art Frog-Learn to do it all. Today's Thank you Card is simple and fun to make. It's play time and elegance all wrapped in one. Love the versatility of the Gorgeous Grunge Stamp Set. It fits every style of stamper-Vintage Grunge, Modern Stylish, Clean and Simple, Shabby Chic, Zippy Quicky and everything in between. Add a little here and a little there for Cute and Quick stamped accents. I have to admit of all the beautiful things in the Holiday Catalog, I am obsessed with the Envelope Liner Framelits. What a simple addition of pure elegance! Add a Candy Dot and I'm done. 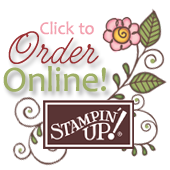 Wetlands is fast becoming one of Stampin' Up! 's most popular stamp sets of the year. There's just something soothing about the beachy scene it creates. Watch for a tutorial later in the week on how to create this beach side scenery. Love stamping my sentiment on the pretty 7/8" Cotton Ribbon.